Treat yourself to the life affirming richness of roasted garlic. Extraordinary Taste. Simple Ingredients. So Good Together. 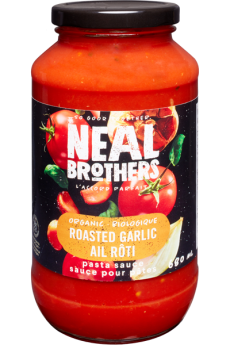 Another delicious discovery made by us—The Neal Brothers. Keep your taste buds in awe…try them all. Ingredients Tomatoes* (Tomatoes*, Tomato Juice*, Citric Acid), Water, Tomato Paste*, Sunflower Oil*, Sea Salt, Onions*, Garlic*, Citric Acid, Spice Extract, Basil*. Refrigerate after opening. Treat yourself to the life affirming richness of roasted garlic. Tomatoes* (Tomatoes*, Tomato Juice*, Citric Acid), Water, Tomato Paste*, Sunflower Oil*, Sea Salt, Onions*, Garlic*, Citric Acid, Spice Extract, Basil*. Refrigerate after opening.